Located on Juniper Island about a mile offshore from Burlington Harbor. As the completion of the Champlain canal helped to bring shipping from the Hudson River into Lake Champlain, the lumbering trade grew coming primarily down from Canada to make Burlington a viable shipping port. Juniper Island was located about three miles from the shoreline and became an ideal place to build a lighthouse. It became the first lighthouse to be built on Lake Champlain in 1826. It finally replaced a light that was mounted on a pole, maintained by a local commercial shipping company to help mariners around the island. The original lighthouse was poorly constructed and fell into disrepair a few years later. 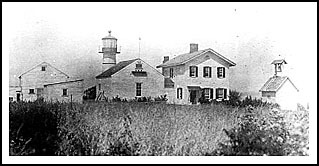 In 1846, the new tower was built with cast iron rings stacked together, similar to Monomoy lighthouse’s construction on the Cape in Massachusetts. The fog bell was positioned atop a wooden shed rung by a clock type of mechanical device. In 1918, strong winds carried away 30 feet of the station's dock. A new concrete dock was erected in 1922. In 1954, a skeletal tower was built nearby to replace the original light, which dwarfed the lighthouse tower. The island was sold to Senator Fred Fayette in 1956. The keeper’s house was destroyed by a careless camper’s fire in 1962. Upon inheriting the island after his death, Fayette’s 11 children helped to restore the keeper’s house in 2001, with much of the effort done voluntarily by family and friends using nearly 18,000 bricks from the original dwelling. Future plans also involve the reconstruction of the tower. 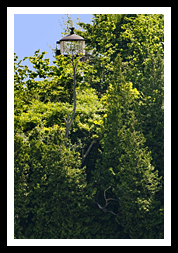 The lighthouse is difficult to see from the water as the surrounding trees consume it. Lake Champlain is comprised of many tiny and larger islands making this area a boater’s paradise. There are many islands that are private and some you can stop over and visit of have a picnic. Juniper Island’s lighthouse is closed to the pubic and is surrounded by trees so views from the water are poor. It is also discouraged to have visitors come ashore as the area is a private residence. If you can get permission ahead of time, it may help your chances of getting a good view from the island itself. If you don’t have your own boat, the Spirit Of Ethan Allen III is a 424-passenger ship that goes past the lighthouse and the other two lighthouses around Burlington on their Scenic Narrated Cruises. 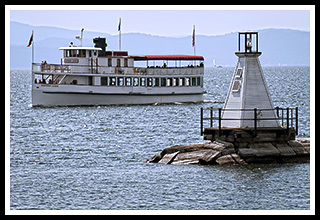 These narrated cruises will take you around Burlington’s Lake Champlain islands, and are offered 4 times a day during the summer season. 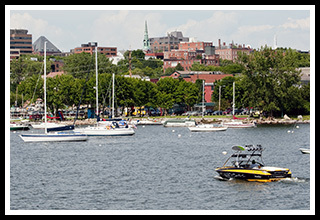 Burlington is Vermont’s largest city that offers plenty of activities, events, specialty shops, restaurants, artists galleries, museums, and places to hike and bike around the area. The Church Street Marketplace is Burlington’s hub of activity with entertainment, festivals, historical architecture, and plenty of places to shop or eat in the area. Burlington’s Waterfront Park provides opportunities to see the Burlington Breakwater lighthouses from the shore, walk along the boardwalk, or take boats out around the harbor and Lake Champlain. The waterfront also has access to the Waterfront Bike Path, and a festival site, which is host to a number of major events throughout the year. Explore 70 species of animals and lots of exhibits at the ECHO Lake Aquarium and Science Center. Explore the Lake Champlain Maritime Museum to learn about Lake Champlain's history through hands-on exhibits, shipwreck discoveries, and viewing full scale replicas of the ships that navigated these waters. From US Highway I-89 take Route 2 Exit 14W into Burlington. Follow straight to Main street. Follow to the bottom of the hill with "Waterfront" signs. Boat cruise and contact info is provided to help you plan your special trip ahead of time and to answer questions before you arrive at the dock. Enjoy! Provide all kinds of dinner and event cruises. Lighthouses can be viewed on the Scenic Narrated Cruise.